The ongoing human tragedy across the Mediterranean and Europe has shocked us all. While we are still waiting for our government to take a firm action and commit to help refugees, charities, NGOs and people across Ireland, have been organising to put the pressure on our political leaders to finally act, as well as find more practical ways to help ease the crisis. To give you an idea what you can do we compiled all calls to action and practical ways you can help in one place. We are updating this page on an ongoing basis so stay tuned and email aga@enarireland.ie if you wish to add or update any information. 1. Attend the refugee solidarity events or organise your own. Ongoing until 19 November 2017 - Join Amnesty’s free online course Human Rights: The Rights of Refugees anytime. It will be available for 12 months. 9:00am – 5:30pm, 19th – 23rd June - Nasc will be hosting UNHCR Ireland‘s Refugee Tent and ‘One Thing’ art project exhibition for World Refugee Week. 2:00pm – GARN street stall on Shop Street. 7:00pm – Response and Responsibility event will address some of the responses to the refugee crisis, and explore how human rights instruments can be used to push governments and decision makers to take greater responsibility. 7:00pm - World Refugee Day talk by Mary Burkart. This talk aims to increase awareness of the issues that make people flee their homes and look for refuge in a foreign country, engendering more considered responses to the issue at local level. Do you have an event coming up or know about one? Let us know by emailing aga@enarireland.org! Join with tens of thousands of people all around Europe by organizing or joining an event in your own town or city. You can find a quick guide on how to organize solidarity here. Ask Minister Fitzgerald to Introduce Safe Passage to provide humanitarian admission for families fleeing conflict. Sign the Nasc petition here. 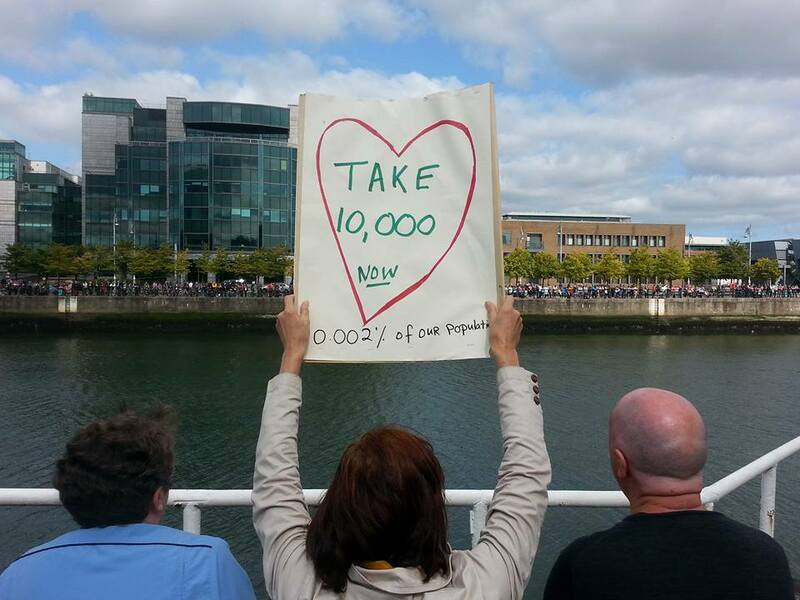 Sign 10,000 Missing Children petition by Bray Refugee Solidarity Group, to put pressure on the EU to take immediate action to ensure that unaccompanied and separated children are guaranteed safety and protection for their basic rights. Support Dublin Calais Refugee Solidarity in their TD letter writing action. Send a letter to politicians demanding action (find TD’s email addresses here) . You can chose to send either short template or long template. Sign the petition calling on the Minister for Justice and the government to live up to Ireland’s commitment to take 4,000 refugees and speed up the allocation of places to those fleeing war and persecution. Ask Minister Fitzgerald to welcome unaccompanied refugee children, stranded in Greece and separated from their families. There are many solidarity groups now set up across the country where people have come together to offer practical help and collect necessary humanitarian supplies. Refugee and Migrant Solidarity Ireland is a group where you can find information on various actions and activities. Please check their Facebook page for updates how you can get involved. 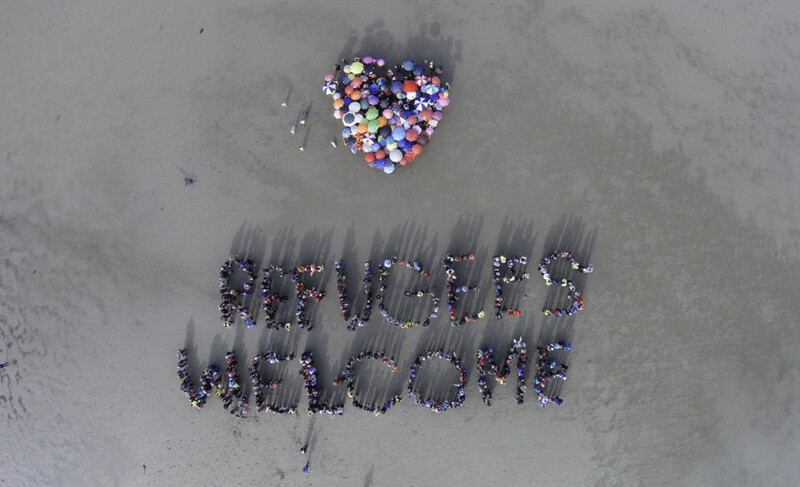 Ireland Says Welcome is an information sharing platform consolidating news and events on refugee solidarity initiatives working across Ireland and Europe. Get in touch with them to see how you can help. Find, like and support your local solidarity group for supporters and volunteers on Facebook HERE. Get involved with the Syrian Support and Welcome group (affiliated groups in West Wicklow and New Ross) that will be welcoming and supporting Syrian refugees to be housed in the Hazel Hotel, Kildare. Laois Toys to Syrian Children in Ireland is collecting toys and bicycles for refugee children arriving to this hotel. Members of the Greek Solidarity Committee have been travelling to the overwhelmed Greek islands such as Kos and Lesbos to offer assistance. If you wish to offer your support you can contact the group’s Facebook page. Apply for the Information and Referral Service/ Drop-in Cenre internship with Irish Refugee Council. Apply by 23rd February. Refugee Rescue is looking for experienced Sea Rescue Volunteers: skippers, medics and swimmers to help with their search and rescue operation in Lesvos, Greece. If you would like to volunteer in Calais please check this ‘Thinking about Volunteering in Calais?’ leaflet prepared by Dublin Refugee Solidarity. You can also contact L’auberge des migrants international, a group who have a constant presence in the camp. Here is a list of volunteering opportunities in Calais camp. Kesha Niya Kitchen in Dunkirk refugee camp may be looking for kitchen volunteers. To get involved and to find out if they are looking for volunteers, please contact volunteer@keshaniya.org. If you would like to volunteer in Greece, Movement on the Ground are looking for people to volunteer in Lesvos. Dublin Calais Refugee Solidarity are looking for various volunteers in Dublin. Check their Volunteer: Outreach and Action page to see who/what skills they are looking for now. Check in the section nr 4 above for your local solidarity groups and contact them directly to check if they need help. Irish group Disaster Tech Lab are sending a team to the islands between Greece and Turkey to build public internet facilities which will serve as public information points as well as allowing the refugees to establish contact relatives and friends. In addition to this they will provide secure WiFi networks for other humanitarian aid workers to use. They are looking for volunteers with specific technical & IT skills (WiFi networking, Vsat, VoIP). Apply HERE. Teach English and welcome new migrants through conversational English classes with Fáilte Isteach. If you have language and teaching skills you can get in touch with you local community or resource centre to see if they need English language teachers. You can also check if ENAR Ireland’s Member organisations based in your area need support. Volunteer for ‘Refugee Phrasebook’ to help new arrivals overcome language barriers and deal with a variety of issues such as seeking asylum, medical attention etc. Help new migrants feel at home by hosting a Welcome Dinner. A Welcome Dinner is simple idea bringing together natives and new migrants to share a meal. It’s all about food, language and social interaction. Many families all over Ireland have signed up to host a dinner in their home. Sign up here through ChangeX and find out more here. Additionally, if you know someone who may benefit from attending one of Welcome Dinners put them in touch with Change X via Email: info@changex.org or by phone: 086 468 5361. Become a member or supporter of the Irish Refugee Council and join their supporters mailing list. If you would like to support the free services we offer for refugees and asylum seekers already in Ireland you can donate here. To find out more about the work they do in Ireland work click here. If you are able to offer other forms of practical support, please contact the Irish Refugee Council info@irishrefugeecouncil.ie with ideas, offers, suggestions. Want to share the experience of exploring history, literature and Irish culture together with asylum seekers, refugees, migrants and local people? Every Friday during Spring and Autumn, the JRS Integration Support Group (ISG) meets to enjoy some of the great amenities that Dublin has to offer. Contact them here to find out more or to join in for their next trip. Jesuit Refugee Service (JRS) welcomes applications from volunteers with special skill sets or qualifications to assist with the design and delivery of new services. Whether you are a teacher or a gardener, a musician or an engineer, an artist or architect; please contact them to find out how you can help. Books in Arabic language, early English learning books, toys, sewing machines, laptops, abayas, head scarfs, new underwear for all ages, new socks, shoes for all ages – for Syrian refugees in Mosney centre. Contact here. Sleeping bags, blankets, water-proof and winter clothes and shoes, hygiene kits - Human Appeal Ireland and The Jacket Off Your Back take all items of clothing, shoes and sleeping bags in good condition. The Irish Benders & Burners collective is currently building stove burners for refugees in France and collecting materials to bring there for tents etc. Snowsuits for baby refugees - Limerick Assists collects baby snowsuits and money to cover the cost of transporting them to refugees in Lesvos, Grece. Children supplies – Slings for Solidarity Ireland are facilitating sending slings, carriers and care packages to as many places as there are families in need. You can find your local collection point HERE. Toys, bikes (for children and adults), car seats and boosters - Laois Toys to Syrian Children in Ireland collects them for refugee children who will be housed in the Hazel Hotel (collections also in West Wicklow and New Ross). Mobile phones, tablets, chargers, power banks - GeeCycle.org collects used smartphones and distributes them to refugees in need. You can also contact Elaine Mernagh, co-founder of Solidarity, an Irish volunteer organisation created to help the migrants in Calais, to donate mobile phones and other related accessories. IT equipment – contact Disaster Tech Lab at contact@disastertechlab.org to see what they need. Medical equipment – Human Appeal Ireland is collecting medical supplies, beds and equipment for hospitals and medical centres in Syria. Instruments – Music Against Borders are taking donations of old or unwanted instruments for the migrants at Calais. Books – the Jungle Library have set up a makeshift library at the Calais camp. Human Appeal collects money to support those fleeing the fighting in Aleppo. You can donate here. They have also been working on the ground with Syrian refugees in Macedonia and Greece. You can support their work here. Refugee Rescue is a team of skilled search and rescue volunteers operating from Lesvos in Greece. To date this small crew have saved over 2,500 lives. If you would like to support this Irish led initiative please visit their website for ways that you can assist their live saving work. Donate to Phone Credit for Refugees and Displaced people to supply refugees with mobile internet and calls. Clare PPN collects money or items to help the Syrian refugee families settle in in County Clare. You can donate here. People to People, Ireland to Greece: Humanitarian Donation Drive by Irish Refugee Council (IRC) can be supported here. Kesha Nyia Kitchen run by volunteers and refugees in refugee Camp de la Liniere Grande Synthe, France collects money for food supplies for the camp. See here how you can support them. Médecins Sans Frontières (MSF), are operating ships in the Mediterranean at present,they are also on the ground in the areas people are arriving at, as they reach Europe. Donate here. Migrant Offshore Aid Station is dedicated to preventing migrant deaths at sea. Donate here. International Rescue Committee improves living conditions by setting up camps. Irish Red Cross provides support for asylum seekers. Their page is here. Concern – you can donate to the Syria Emergency Appeal here. Trócaire – donate for their Refuge Crisis Appeal here. The UNHCR can be donated to directly here. You can offer a bed to someone seeking refuge as a powerful way of showing solidarity. That pledge does not necessarily have to be a definitive commitment, and anyone who signs up can opt out. Over the past few weeks over 14,000 beds were pledged via this Uplift campaign. The Irish Red Cross has now been appointed the official organisation to manage these offers. You can register your offer of accommodation and find out what’s involved on the Red Cross website. Refugee BnB looks for people willing to host a refugee family for a year starting from January 2016. Welcome Café: A regular meet up the last Tuesday of the month to create a space of welcome to celebrate diversity and encourage intercultural exchange. Welcome Dinners: Welcome Dinners, an initiative of ChangeX, provides a very easy and enjoyable way to make a change in society today, to work towards a more inclusive, more understanding community. The concept is simple: invite a newly-arrived immigrant to your home for dinner, sit down, chat, get to know about each other’s cultures, share some food, have a drink, and that’s about it! ChangeX can put you in touch with migrants who would like to be a guest at an Irish dinner table. Refugee and Migrant Solidarity Diners: Join RAMSI for their very popular, monthly ‘Solidarity Dinners.’ A wonderful opportunity to eat good food, meet like-minded people and raise much needed funds for refugees and migrants in Ireland and abroad. Check their Facebook page for the next dinner. The Integration Support Group: The ISG, run by Jesuit Refugee Service Ireland, is designed to help migrants learn about Irish culture, engage with the local community and public services whilst supplementing formal language provision with informal social opportunities to practice English. The ISG promotes integration by facilitating cultural exchange between asylum seekers, refugees, migrants and the local Irish community who all share the experience of exploring history, literature and culture together. If you would like to get involved get in touch with JRS here. This refugee crisis isn’t the first time Ireland has failed those fleeing military conflicts, torture and oppression. Thousands of people continue to live in the inhumane and widely criticised Direct Provision system in Ireland, which has been called the Magdalene Laundries of our generation. Support the #EndDP campaign and organisations helping those in Direct Provision, such as Irish Refuge Council, Doras Luimni, NASC, Jesuit Refugee Service, Crosscare Refugee Project, ARN or join your local End Direct Provision group in Cork, Dublin, Limerick or Galway. Support groups organised and led by people living in the Direct Provision system such as Movement of Asylum Seekers in Ireland (MASI) and KRAC Asylum Today. You can donate to support MASI activists here. Support the education of asylum seekers & refugees in Ireland by providing them with financial support to access education and training. Email EducationGrants@irishrefugeecouncil.ie if you want to make a donation. If anyone tries to justify their anti-refugee position by recalling Ireland’s housing crisis you can also point them to the below the Irish Housing Network Facebook status, a front-line organisation for Irish housing crisis. It will help you to stress that their views are not in line with the official campaign. Debunk myths about the refugee crisis and get the facts straight. Here is a list of ten truths about Europe’s migrant crisis and five major myths of Europe’s refugee and migrant crisis we can often see in the media and online comment sections, as well as repeated by politicians. This great online “hoax map” is compiling and debunking false rumours and stories that broke out about migrants. Read the summary of Amnesty International comprehensive assessment of the global refugee crisis setting out a fair and practical solution to the crisis based on a system that uses relevant, objective criteria to show the fair share every state in the world should take in in order to find a home for 10% of the world’s refugees every year. UNHCR Ireland’s ‘Refugees’ and ‘Migrants’- What’s the difference and why does it matter? We highly recommend watching this video that explains the causes of the current refugee crisis and situation in Syria while debunking myths and misinformation in just 6 minutes. As the refugee crisis unfolds across the EU, we’ve seen an increasing number of racist comments online, social and traditional media as well a raise of racist violence. 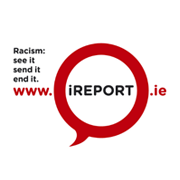 If you come across any racist incident or content, please take a screen shot (if applicable) and report it to our racist incident monitoring tool www.iReport.ie so we can monitor and keep a record. If you wish to add or update any information provided here email aga@enarireland.ie.